Up to now, we have covered Maven build lifecycle, plugin, repository and dependency management. In this part, let explore Maven module, setting, profile and IDE plugin. Maven module is the part where Maven offer additional value to Ant. If you remember, Ant do not have project dependency, rather it only has task dependency. Of course, developers can use dependent tasks to execute other project build file, and through that, indirectly achieve project dependency. However, this is tedious. Moreover, if you want to child build.xml to inherit some properties, settings or even some tasks from parent build file, then it is even more difficult. Maven take the project modules as part of its core concept and natively support it. Let start with a simple example. We have a nested project here with the parent project named sample_maven_module. This project has 2 child projects, sub_module and web. 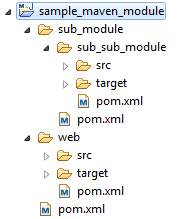 The child project sub_module has another child project named sub_sub_module. As you can see, a project can only have modules when it is packaging as pom. Parent project serve a special purpose, it is used to define common settings and declaration for child modules. If take a look at the effective pom view of child module, then we will see the parent plugins and dependencies above will be automatically inherited by the child modules. With this feature, developers can define a common version for log4j, Spring framework, Junit or whatever plugins setting in the project. Then, in the sub_sub_module project the source will be set to 1.7 rather than 1.6 as declared in grant parent project. There are two things to note about modules. Firstly, whatever mvn command trigger on parent project will be triggered by child projects as well. Secondly, Maven is smart enough to identify cross dependency among child modules and trigger the command in a proper order. However, if there is no cross dependency, the order of execution will follow declaration order. For example, in the above project, we declare of sub_module in front of web. Normally, Maven will trigger command on sub_module, then web. It is understandable because the child module appear as dependency should be build first and Maven explore sub_sub_module only after exploring its direct parent project. Assume that with the knowledge above, you have setup a wonderful Maven project that build like charm. Now, there are few common challenges that you may need to face if we deploy our project to other servers. The database is set-up differently in Jenkins server and you may need another configuration for the sql plugin to populate test data. Moreover, the remote repository to deploy artifact may require authentication. For this kind of purpose, we need Maven Settings and Profiles. The first file contain global settings for Maven while the second file contains settings for specific user. Most of the time, we only need one. There are reason for different mechanism of storage. Settings is considered more environment related than profile. Moreover, Settings is hidden from the projects itself. From personal experience, I often use the Maven Settings to store information about remote repository and active profile. If you want to shorten the pom file, whatever common information about the infrastructure can be put under this file as well. If a profile is not activated, all the contents inside are simply ignored by Maven. All famous IDEs has support for Maven. However, they follow different approachs to make Maven work in IDE. With the only exceptions is Eclipse, all other IDEs let Maven run natively within the IDE. It means that any mvn command you trigger in IDE will effectively send the identical command to the console in project home. This works like you have a console open next to your IDE, just more convenient. Eclipse Maven plugin (m2e) is much more ambitious. It tries to interpret Maven pom file to Eclipse project configuration. However, the biggest problem with this approach is the incomplete implementation. Many years after first release, the conversion of many Maven plugins to Eclipse configuration are not yet supported. It may be frustrated that Eclipse show error in pom file even the file is perfectly correct because m2e does not recognize the setting. Still, Eclipse approach bring some benefit, the first and foremost is workspace resolution. It helps when you build a project with multiple module. In stead of downloading dependencies from repository, m2e attempt to find any corresponding project and include this project in classpath rather than the packaged jar file. This provides immediate reflection of any API changes without going through the hassle of building dependent project. As Eclipse settings do not fully support Maven configuration, here are some of the common problems that you may encounter when using m2e plugin in Eclipse. 1/ Eclipse does not support dependency scope. Simply speaking, when the plugin help you to configure the classpath, it does not differentiate compile, runtime or test scope. Hence, in your IDE, no matter what scope you put, it always work but when you create deployment, only compile scope dependencies are available. 2/ Another similar issue is the lack of scope support for source folder. Most of common Maven projects includes src/main/java and src/test/java folder. However, if this project in included as dependency, Eclipse cannot differentiate the test source and main source folder. The consequence is the inclusion of test source folder into project classpath, which is not wanted.